Add flexibility to your workspace, with this gooseneck tablet holder for most 7" to 11" tablets. The desk-mount tablet stand has an adjustable clamp that fits tablets with a width or length of 6.5" to 7.8" (166 to 200 mm) and a maximum tablet thickness of 0.45" (11.5 mm). Mount your tablet width-wise or length-wise, and rotate it 360-degrees. Use it with your Apple iPad, Samsung Galaxy, Microsoft Surface 3 or other tablets. 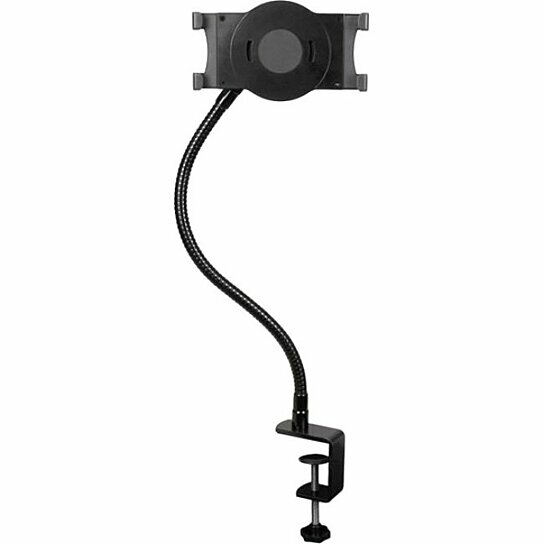 Place your tablet exactly where you need it and position it to your preferred viewing angle with the flexible 19.7" (500 mm) gooseneck arm, bending 360 degrees in any direction. It tilts, turns and rotates, letting you easily switch between landscape and portrait position. The arm is simple to mount on a desk, counter, tabletop or any other surface, with a thickness of 0.8 to 1.9" (20 to 50 mm). The included clamp holds the arm securely in place. The tablet holder is detachable with quick-swap attachments that let you remove the tablet from the arm and pop it back in as needed. Install a tablet beside your display for easy reference to documentation, presentations and research. With the gooseneck arm in place, it's easy to integrate a tablet into your work space and keep your hands free to type and swipe. Using a tablet hands-free can be helpful for individuals with mobility challenges. The TAA Compliant ARMTBLTUGN is backed by a 2-year StarTech.com warranty and free lifetime technical support.